The SKKY Hotel is proud to announce that it will be a sponsor the Yukon Quest in 2016. It will be the first year of sponsorship for the SKKY Hotel. Everyone at the SKKY Hotel is excited for the opportunity to support this great race and everyone involved in making it happen. The SKKY Hotel looks forward to sponsoring the race in the coming February and in years to come. For those unaware, the Yukon Quest is the dog-mushing race that alternates between going from Whitehorse to Fairbanks every year. In 2016, the race starts in Fairbanks, on Feburary 6th and will finish in Whitehorse between the 15-20th. 25 teams are currently registered to race their dog teams over the 1,000 mile course along the Yukon River. It is quite the spectacle to see and we hope to see some of you staying with us in February to experience this great event! The Yukon Quest 1,000 Mile International Sled Dog Race gets its name from the “highway of the north,” which is the Yukon River and the historical winter land routes travelled by prospectors, adventurers and mail and supply carriers traveling between the gold fields of the Klondike and those in the Alaska interior. In 1983, four mushers sat at a table in the Bull’s Eye Saloon in Fairbanks, Alaska. The conversation turned to a discussion about a new sled dog race and “what-ifs”. What if the race followed a historical trail? What if it were an international sled dog race? What if the race went a little longer? What if it even went up the Yukon River? As early as 1976, a Fairbanks to Whitehorse sled dog race had been talked of. But it wasn’t until this conversation between Roger Williams, Leroy Shank, Ron Rosser and William “Willy” Lipps that the Yukon Quest became more than an idea. The mushers named the race the “Yukon Quest” to commemorate the Yukon River, which was the historical highway of the north. The trail would trace the routes that the prospectors followed to reach the Klondike during the 1898 Gold Rush and from there to the Alaskan interior for subsequent gold rushes in the early years of the 1900s. The first Yukon Quest 1,000 Mile International Sled Dog Race tested both race logistics and the talents of all involved. Twenty-six teams left Fairbanks in 1984. During the next 16 days, 20 teams arrived in Whitehorse. Six teams were forced to drop out along the way. SKKY Hotel guests will have full access to Better Bodies Whitehorse – for free! Better Bodies is the premier fitness club in the city with plenty to offer. This is an exclusive offer to SKKY Hotel guests – the premier hotel in Whitehorse partnering with the premier fitness facility in the city. They are open 364 days per year with hours that will appeal to both business and leisure guests of the hotel. Check out their Facebook page or webpage for what they have to offer, and contact our Front Desk when you’re ready to get your heart racing! 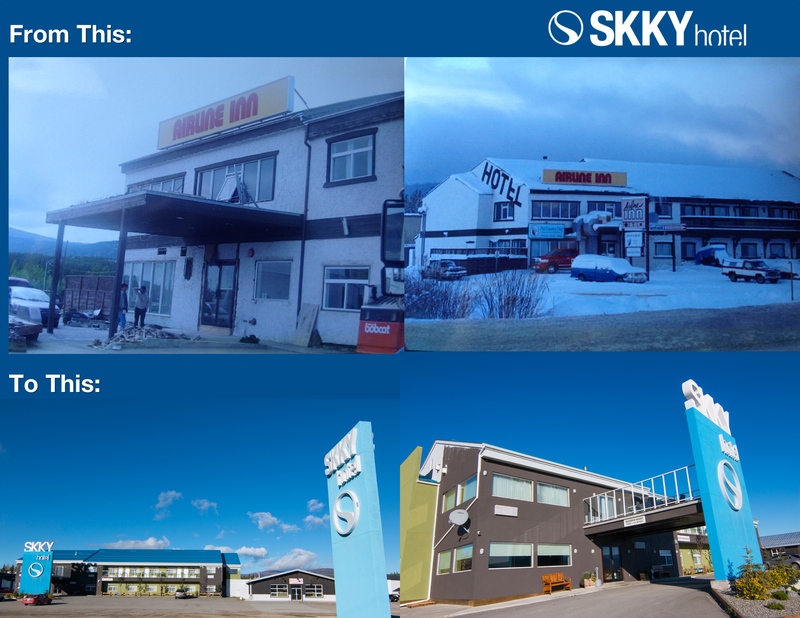 The SKKY Hotel opened five years ago, on February 9th, 2009. It’s been a whirlwind of a journey from getting the hotel renovated, finding qualified staff and management, and getting the word out. The SKKY Hotel has persevered to become the top ranked full-service hotel on TripAdvisor over the years. My husband and I were in Whitehorse for our first time in November and stayed at the hotel for 2 nights. We loved the fact that it was across from the airport and there was a shuttle bus that picked us up. The rooms are modern and the beds are extremely comfortable. The hotel is very clean and the staff was very friendly and helpful. The restaurant which is attached to the hotel had great food and very reasonable prices. We would recommend this hotel and restaurant to anyone travelling to Whitehorse. Brand new, nicely appointed rooms, friendly staff, white linens. Walking distance from the airport – ie not in the downtown if that’s important to you . A nice change from the typically tired or bland (or sometimes shoddy) hotels of Whitehorse and I’ve stayed in most over the years. Time will tell how well some of the furnishings wear at the Skky but it’s very nice right now – especially for Whitehorse. The last quote was one of the very first reviews for the hotel. Needless to say, time has treated the SKKY Hotel very well as more and more people discover the finer qualities we have to offer. If you are reading this and haven’t stayed with us before, we invite you to experience one of the best hotel stays you can have North of 60 – and you don’t have to take our word for it. Read through the reviews and see for yourself: TripAdvisor or Booking.com. And then you are worse than the worst. It seems it will be to the end. Robert Service was one of the first story-tellers to spin tales about the Yukon. Tonight is going to be the beginning of a new tale, and it has a lot of us Yukoners excited. Klondike is a mini-series on Discovery Channel, telling the story that takes place during the Klondike Goldrush of the late 1890’s and early 1900’s. It is exciting enough that a major network is showcasing the Yukon on television, but it is who is involved in the project that is adding to the excitement. Ridley Scott is the main actor, a face better associated with the character Robb Stark in Game of Thrones. The other cast members have been in some highly touted feature films in recent years, several have been nominated for Academy Awards. The acting should be top notch. Her tale brings to life the story of six strangers and their collective fight for survival and wealth in a small frontier town in the remote Klondike. This man-versus-nature tale places our heroes in a land full of undiscovered wealth, but ravaged by harsh conditions, unpredictable weather and desperate, dangerous characters including greedy businessmen, seductive courtesans, and native tribes witnessing the destruction of their people and land by opportunistic entrepreneurs. Visit the Discovery Channel’s website for more information about the cast, behind the scenes videos, and more about the history of the Klondike. Skagway – the other Gold Rush town in Alaska where most of the pioneers started their journey north to Dawson. Klondike: The Last Great Gold Rush) – a historical book full of anecdotes from the great Canadian author, Pierre Berton, who’s parents were early settlers of the Yukon. Berton was born in Whitehorse before moving to Dawson City as a child. Poems of Robert Service – the Bard of the Yukon. The Cremation of Sam MacGee and The Shooting of Dan McGrew are his two more famous poems.